Bassu Botanical Penetrating Oils: Babassu, Aloe and Flax Seed Oil provide the ultimate in penetrating moisture, shine and condition. The Babassu tree is known as ‘The Tree of Life’ and is a superior emollient for dry or oily hair and skin. Aloe is used for its soothing and healing properties while Flax seed is antioxidant rich and known as nature’s richest source of omega-3 nutrient. Babassu oil melts at body temperature and penetrates hair and skin with healing properties. Trinity Vegan Protein Complex: Gluten Free Vegan Proteins of Amaranth, Keravis and Soy repair and strengthen hair from the inside out. Amaranth is known as the ‘Never Fading Flower’ and has a natural resistance to UV. Amaranth is noted by the National Academy of Sciences as ‘One of the Best Protein Sources’. Soy adds flexibility while Keravis adds natural shine. Trinity Vegan Protein stays flexible with the ability to layer on the hair creating volume and strength while never over proteinizing. Trinity provides peak performance in high humidity and heat. Heat styling maximizes Trinity Vegan Protein Reconstruction. Essential Micro Minerals: A natural addition to hair care is the micro mineral ferments of Zinc, Copper, Magnesium, Iron and Tourmaline. These natural mineral ferments and antioxidants aid in stabilizing healthy cell turn over and in development of new cells and promoting hair growth (anti-aging). Tourmaline aids in the overall conditioning and reduces styling time. Botanical Extracts: Botanical Extracts of Saw Palmetto, Camellia, Ginkgo, Hops, Balm Mint, Panex Ginseng, Maranium and Nettle; this complex of ferments and extracts nourish, encourage and invigorate growth while working to decrease DHT. 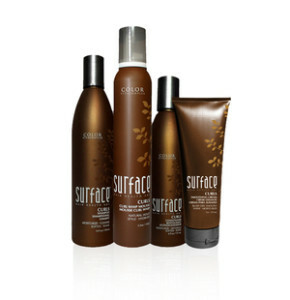 Natural Styling: Sugars and vegan starch provide styling products with resilient humidity resistant hold. NO PVP/VA (plastics). 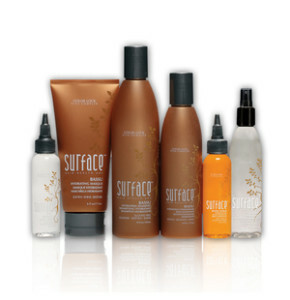 Natural Cleansing: All sulfate free shampoos are NOT created equal. 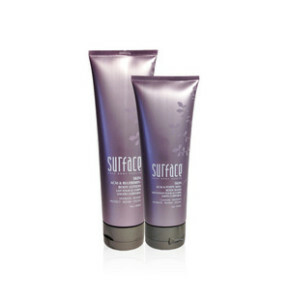 Experience the luxurious velvet lather with Surface shampoo’s organic cleansers naturally derived from Babassu, Palm and Coconut oil. Cleanse thoroughly yet gently while respecting hair color and condition. 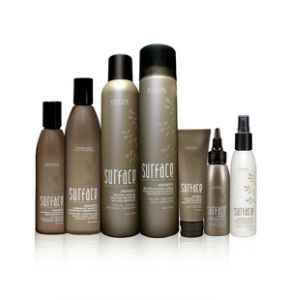 Surface shampoos are pH balanced 4.5 to 5.5 and are sulfate FREE.